Hiking is an opportunity to witness wildlife, nature and majestic views while participating in physical activity. You can find trails to hike in suburban wooded parks, state parks or national forests with the trails ranging in distance from one to several hundred miles. The short trails, such as a two-mile trail, offer the ability for day hikes for a wide range of ability levels. The calories burned on two-mile hikes vary according to your intensity level -- this includes hiking speed and terrain, along with your bodyweight and pack weight. A two-mile hike is a relatively short hike, but the time frame required to complete the hike can range from 20 to 120 minutes based on your average hiking speed. For example, some Grand Canyon hikes that require uphill hiking result in an average speed of about 1 mph while flat trails allow you to reach speeds of 4 mph. 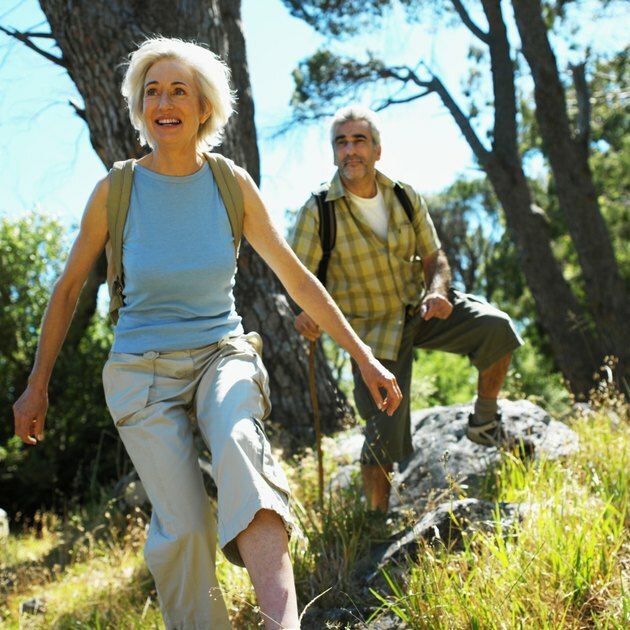 As your hiking speed increases, so does the average number of calories burned per hour during the hike. If you hike at 2 mph and weigh 160 lbs., you will burn about 183 calories per hour, but increasing the speed to 3.5 mph results in burning 277 calories per hour. Choosing rugged terrain is one way to increase the number of calories burned on a two-mile hike. For example, a male weighing 190 lbs. and hiking on moderate terrain burns about 646 calories per hour. But that number increases to about 776 calories per hour when climbing hills. Your bodyweight is the most important consideration for the number of calories burned on a two-mile hike. As your bodyweight increases, your body must work harder over the course of the hike, resulting in more calories burned per hour. For example, if you are hiking and weigh 200 lbs., you will burn about 637 calories per hour. But someone who weighs 240 lbs. will average about 763 calories per hour. While most two-mile hikes don't require a significant amount of pack weight, some technical trails require additional climbing or hiking equipment. As a result, wearing a weighted pack adds to the number of calories burned during the hike. Packing additional weight over rugged terrain results in burning the most calories. For example, carrying a pack weighing 42 lbs. over rugged terrain burns about 776 calories per hour for the average male and about 665 calories per hour for the average female. "Fitness": How Many Calories Are You Really Burning?